As you may have noticed we’ve gotten an influx of Zevia reviews in the past few weeks. This is because the kind folks at Zevia sent us a sample of all their flavors. One of the two I’ve chosen to review is Zevia Ginger Ale. Zevia of course is sweetened with the stevia leaf, a natural sugar alternative that has zero caloric value. Zevia soda is also 100% all natural… something we can all get behind. Adorning the side of the can I’m about to open are the words “It’s what soda should always have been.” Hold up there Zevia, let’s just see about that. I’ve had stevia sweetened drinks before and while initially the taste is good the aftertaste always ruins the party. This is one reason I chose ginger ale as one of my two flavors to review. I believe that ginger ale should have a muted enough aftertaste to hopefully knock out any trace of stevia. Let’s find out! Upon sniffing said all natural soda I find a light ginger scent wafting out of the drink hole. Putting my face this close to the can makes me realize that I never mentioned the can art itself. I like it. It’s a simple olive/forest green background with the bubbly Zevia logo floating along with the bubbles. It’s not flashy but it’s unique enough to catch the eye. I’ll have to find out if they make shirts. Time for a taste. Ok, well my initial fear is somewhat quelled. Zevia Ginger Ale is one of the lighter flavored ginger ales I’ve tasted to this point. 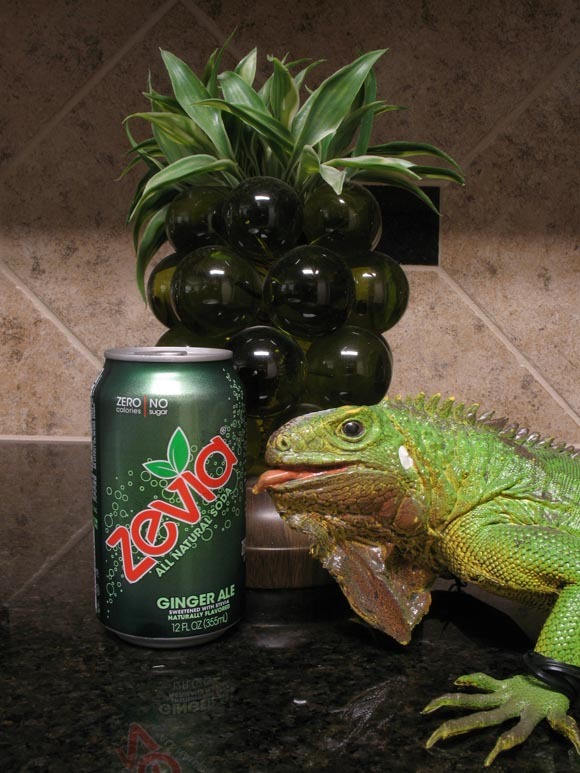 The taste that you experience throughout the Zevia Ginger Ale drinking process never changes. It’s a lightly flavored ginger soda that tastes a little chemically due to what I can only imagine is the stevia. Since the drink itself tastes oddly chemically there is no chemical aftertaste… because the taste never changes enough for me to consider it an aftertaste. I really wish I could like this soda but I probably won’t drink it ever again. I can finish this can and at the end of the review I’ll suggest that you do the same. (*Note* I tried to finish the can and got to the point where I didn’t want to try anymore. Ultimately this is what dropped the score. *End Note*) The stevia aftertaste, which in this case is the actual taste, isn’t for everyone which means it’s also for someone. I’m just one of those people that isn’t a fan of it. I like the concept behind stevia sweetened sodas but the delivery always falls short. I will say that we’ve reviewed a beverage that was half sugar, half stevia sweetened and that it was fantastic! Maybe that’s what needs to happen here. Is zero calories so much better than half the calories of a normal soda when the taste is put into jeopardy? It’d still be all natural but the aftertaste that many of my reviewers have noted would probably be gone. As a diet soda it’s a great alternative! I mean it’s an all-natural diet soda… that’s wonderful but at the end of the day I have to judge this on a normal soda scale. If you were reading then the upcoming verdict should be of no shock. Great ingredients, good can art, meh flavor that gets worse the more you drink it.